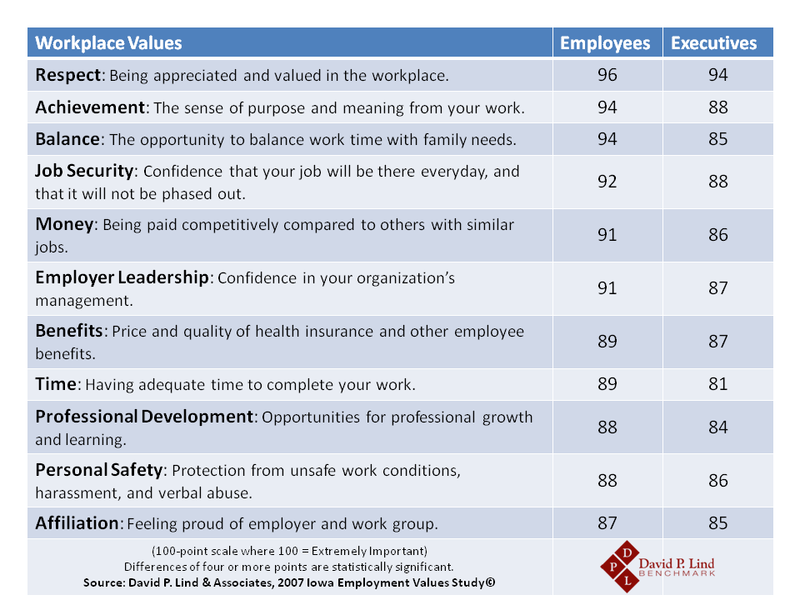 Our 2007 Iowa Employment Values Study sheds light on many questions that employers continue to wrestle with today…namely, what workplace values are most important to their employees? In last week’s blog, I discussed the 11 key workplace values that are ranked by employees and their executives. Of the 11 workplace values rated, Benefits ranked number seven, which was seven points less than the top-ranked value, Respect. Within this Study, differences of four or more points are statistically significant. The three values that were at least 4 points greater than Benefits were Respect, Achievement and Balance (having the opportunity to balance work time with family time). The other three ahead of Benefits, but fewer than four points were: Job Security, Money and Employer Leadership. Time will tell whether employees continue to rank these values in a similar fashion from six years ago. 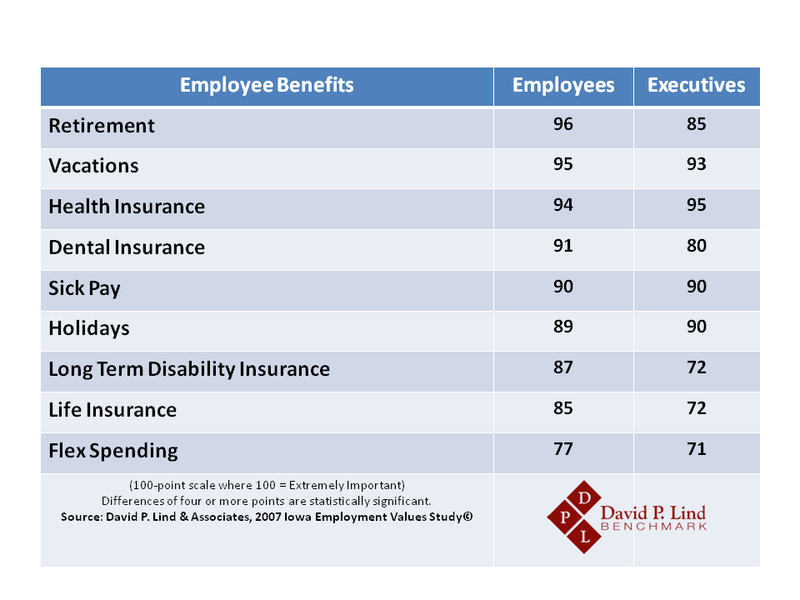 We asked employees and their bosses in this Study to rank the importance of nine benefits (Table below). The bosses (executives) rated how important they believed each benefit was to their employees. NOTE: The questions were presented to respondents using Likert scales. Scored on a 1 to 100 scale, the highest number represents the most positive response. As you might expect, Health Insurance and Vacations are rated highly by both groups. In most other benefit categories, however, executives underrated the importance to their employees. Benefits by Gender: Females reported almost all benefits as more important than their male counterparts. Female employees responded that Sick Pay and Holidays were much more important than their male counterparts and female executives recognized this importance. Also, Health Insurance, Long-Term Disability Insurance, Life Insurance and Dental Insurance were much more important to female employees than male employees. Male executives were the least cognizant of the importance of all of the benefits listed to their female employees. Benefits by Age: Categories of those younger and those older than 50 years of age were also studied. With the exception of Health Insurance, executives under 50 grossly underestimated the importance of benefits to their employees, especially Retirement, Long-Term Disability Insurance, Life Insurance and Flex Spending. Employees of both age categories rated the importance of these benefits similarly, with the exception of Flex Spending which was much more important to the younger group of employees. Benefits by Tenure: Employees with five years or less at their current job consider Health Insurance to be the most important benefit. However, those employees with greater tenure consider Retirement plans most important. Executives underestimated the importance of five major benefits (Retirement, Dental Insurance, Long-Term Disability Insurance, Life Insurance and Flex Spending). This Study also found that executives with less tenure are slightly more accurate in their perceptions than those with greater tenure. Executive responses from smaller organizations disclose that they are less in tune with what is important to their employees than executives from larger organizations. Since turnover can be even more crippling to a small organization, these executive misperceptions are extremely important to recognize. The results from this Study reveal that executives from smaller organizations need to better understand the importance of employee benefits to their staff. To attract and retain employees, it is critical for organizations to understand what drives commitment – particularly among top performing employees – and act on it. Iowa employees responded negatively to their organization’s ability to recognize and reward the best workers and to the availability of advancement opportunities within the organization. The clear disconnect between employers and their employees in this six-year-old Study should encourage Iowa organizations to review their workplace environment and consider enhancements to their total rewards program. What Iowa Employees Value Most – Lessons to be Learned? Although it has been six years since we completed the “Iowa Employment Values Study,” the lessons learned are still important today. In fact, in some cases, we may assume the results are…timeless! This Study was conducted in 2007 to better understand the opinions, perceptions and values of Iowa employees and how they differ from those of executives in Iowa organizations. With assistance from Data Point Research, Inc., almost 700 people were interviewed from 56 different organizations. Executives numbered 159 while 537 were employees. The intent of the Study was to ask employees what 11 key workplace ‘values’ were most important to them – and if these values would keep them employed at their particular organization. In addition, we asked the executives within these organizations to rate how important these same values were to their employees. As you might expect, the results were both revealing and, in many cases, reassuring. Employees regard every value statement as more important than executives realize. The order of importance of those values to employees was clearly misunderstood by Iowa executives. NOTE: The questions were presented to respondents using Likert scales. Scored on a 1 to 100 scale, the highest number represents the most positive response. From the table we learn that executives understand Respect at the workplace and a sense of Achievement on the job are very important values to their employees. However, when ranked, executives mistakenly believe that Job Security, Money, Employer Leadership, Benefits and Personal Safety are all more important to their employees than the opportunity to Balance work time with family needs. 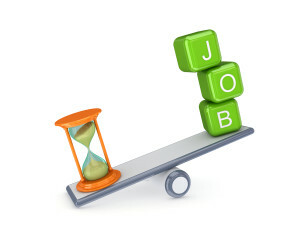 THE GREATEST ERROR OF EXECUTIVES IS UNDERESTIMATING THE IMPORTANCE OF WORK-LIFE BALANCE TO THEIR EMPLOYEES. The importance of employees having a well-rounded lifestyle is critical to the mental well-being of employees – and Iowa employers should take note. By Gender: Female executives are in-tune with female employees. In contrast, male executives underestimated the importance of many values to both male and female employees. The largest disconnect being the importance of Balance and Time to their female employees. By Age: Separated into categories of those younger and those older than 50 years of age, executives under 50 underestimated the importance of workplace values for their employees in all 11 categories. Employees, regardless of age, rated workplace values similarly. By Generation: Generation X employees (born between 1967 – 1976) rated Money as the second least important workplace value, considerably lower than the other generations. All generations of executives significantly underestimated the importance of Balance and Time to all generations of employees. By Income: Lower paid executives clearly underestimated the importance of 10 of the 11 workplace values to employees who earn less than $50,000 (79 percent of the respondents). Iowa employees value Respect, Achievement and the opportunity to Balance work time with family needs as most important, even more important than pay. In today’s globally competitive environment, Iowa employers will need to create a culture that is more responsive to these employee needs and values to attract and retain qualified employees. Being appreciated and valued on the job is the number one value to employees. When asked “What is the one main thing your organization could do better?” the answer: “Show appreciation for hard work,” was consistently heard. This is not an expensive solution, as appreciation can be effectively expressed in a non-monetary way. Similarly, employees who are proud of their organization were significantly more positive about all aspects of their job. 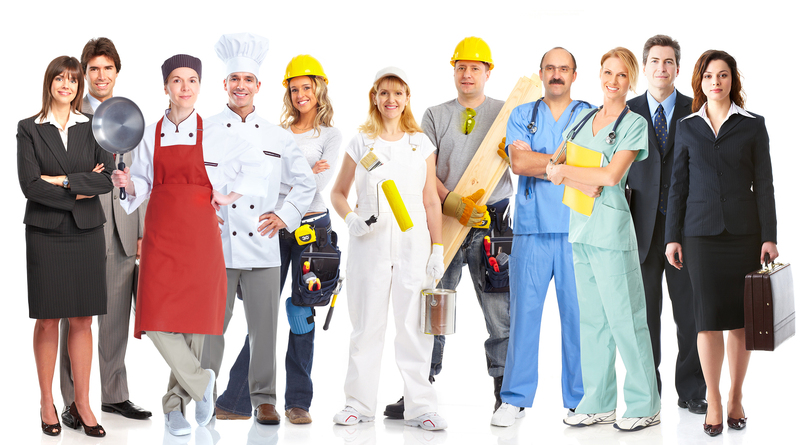 Employers are best served to communicate accurate details about the organization to employees and foster employee pride. Organizations may also consider flextime programs that allow for individual needs, as employees responded overwhelmingly in this Study that they value a healthy work and family balance. I will continue to ‘dust off’ other gems found within this report, which to my knowledge, was the first study of its kind within Iowa that objectively addressed the disconnect between employer-employee opinions on employment values. Performing another Study similar to this one is definitely on my wish list for the future!